Process or analytical instrumentation engineers looking for a flow verification solution for their process analyser sampling systems, and specifically when it is part of a safety instrumented system (SIS) process will be interested to learn that the Model FS10A Analyser Flow Switch/Monitor from Fluid Components International (FCI) meets the requirements for Safety Integrity Level (SIL) 2 compliant service. 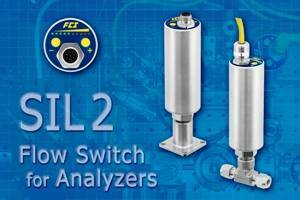 FCI’s SIL 2 compliance rating for the FS10A Analyser Flow Switch/Monitor has been documented in a failure analysis report with FMEDA techniques by the accredited certification body exida. The FS10A has been classified as a Type B subsystem in accordance to IEC 61508-1 with a hardware failure tolerance of 0. The average probability of failure on demand (PFD) and safe failure fraction (SFF) meets the requirements for SIL 2 compliance set forth in the standards. The advanced Model FS10A Analyser Flow Switch/Monitor represents the best-in-class, solution for continuously verifying flows within liquid or gas process analyser sampling systems. It is a small, lightweight instrument featuring superior low flow sensitivity, a relay alarm trip point, an analogue output and an RS232 interface. The FS10A’s advanced electronics and thermal dispersion flow sensing technology provide an accurate, repeatable and superior overall solution for sampling system flow assurance. The FS10A Analyser Flow Switch/Monitor ensures continuous reliability and requires virtually no maintenance, featuring a precision flow sensor element with no moving parts to foul, clog or maintain. Unlike alternative technologies, such as magnetic floats, capillary bypass or rotameters, the FS10A has no cavities, orifices or dead-legs that can trap fluids and lead to contaminated samples, which preserves sample integrity and provides faster system sampling times. The instrument’s wetted parts are corrosion-resistant 316L stainless steel with Hastelloy-C22 sensor tips. The FS10A Analyser Flow Switch/Monitor is ideal for use with nearly all types of process and emissions sampling systems, including gas chromatographs (GCs), mass spectrometers, optical spectrometers, photometers and others. Standard configurations will accommodate standard 1/8, 1/4, 3/8 and 1/2 inch tubing as well as an SP76 adapter (ANSI/ISA Standard 76.00.02-2002, Modular Component Interfaces for Surface-Mount Fluid Distribution Components). The SP76 adapter is a key element of the NeSSITM platform (New Sampling / Sensor Initiative). The FS10A conforms to NeSSI Generation I and is prepped for Generation II and III compliance, requiring only a single 1.5-x-1.5-inch SP76 base. Depending on the tube size, theFS10A Analyser Flow Switch/Monitor operates over a wide flow range in air/gas; from 10 cc/min to 100,000 cc/min, and in water/liquids; from 0.70 cc/min to 750.00 cc/min. It accommodates wide turndowns with a ratio up to 100:1. The FS10A Analyser Flow Switch/Monitor’s advanced electronics are packaged in fully-sealed aluminium housing, making it ideal for rugged plant environments. The electronics can be integral mounted with the sensor element in a uni-body configuration or remotely mounted for easy front panel display viewing. The FS10A features a top-mounted, ten LED array and two pressure-sensitive buttons. The LED display shows flow rate trend, alarm status and power on/off so operators have at-a-glance knowledge of operating conditions The monitor’s set-up (zero and span) andtrip-point values can be changed via the two push-buttons or via its RS232C serial interface. The FS10A Analyser Flow Switch/Monitor outputs include a 1A relay settable for NO or NC operation and with user-settable for failsafe, hysteresis and/or time delay, and a 4-20mA analogue output for trending. In addition to SIL 2 compliance, agency approvals for the FS10A Analyser Flow Switch/Monitor include FM, FMc, ATEX and IECEx for hazardous location installations.